In recent years, tackling health inequalities has become a key policy objective in the UK. However, doubts remain about how best to translate broad policy recommendations into practice. One key area of uncertainty concerns the role of local level initiatives. This book identifies the key targets for intervention through a detailed exploration of the pathways and processes that give rise to health inequalities across the lifecourse. It sets this against an examination of both local practice and the national policy context, to establish what works in health inequalities policy, how and why. Authoritative yet accessible, the book provides a comprehensive account of theory, policy and practice. It: spans the lifecourse from the early years to old age; explores the links between biological, psychological, social, educational and economic factors and a range of health outcomes; describes key policy initiatives, assesses research evidence of 'what works' and examines the limitations of the existing evidence base; highlights key areas of debate. 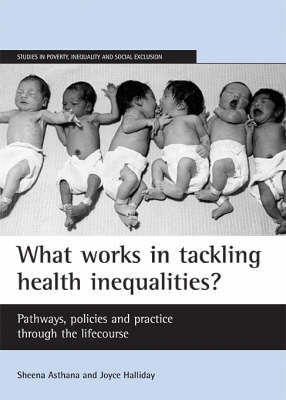 "What works in tackling health inequalities?" is essential reading for academics and students in medical sociology, social psychology, social policy and public health, and for policy makers and practitioners working in public health and social exclusion.